Paine Park, a skateboard park near the Philadelphia Art Museum. An aerial view highlights creative shapes and patterns in a way you just couldn’t achieve from the ground. As a kid, if you asked me what kind of animal I wished I could be, I would’ve answered eagle in a heartbeat. I dreamt of soaring through the clouds, peering down at the earth far below. As an adult, I’ve come pretty close to this feeling when I’m up in a helicopter capturing aerial photographs of buildings, skylines and neighborhoods. A wide view from above highlights suburban America’s highways, shopping malls, and office buildings. Aerials capture an important viewpoint when documenting a site or structure. When a commercial realtor is marketing an office building or shopping center, showing the location from the air gives potential buyers a clear sense of scale and context. 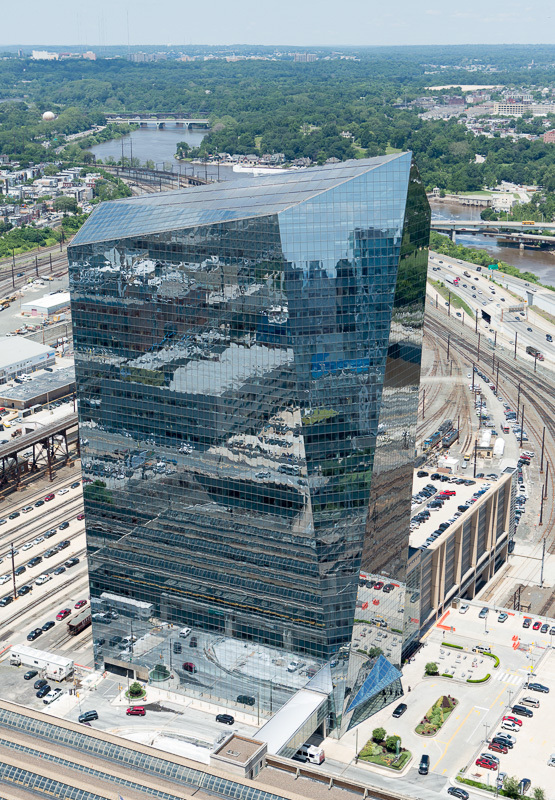 Shot from high up, the Cira Center in Philadelphia reflects its surroundings. A view from up high can be a powerful and dramatic way to show a project in a completely different way, like an architect's scale model come to life. Sometimes when I’m hovering overhead in a helicopter, I feel like I’m looking down on my own personal model train set. What a feeling! Aerial photography showcases the lush green campus of Glaxo Smith Kline in King of Prussia, PA.
Capturing excellent aerial photographs is not easy. It requires a great deal of planning, teamwork, communication — and strong nerves, as you’re hanging out of the open door of a small two-person helicopter trying to find the perfect angle. An overhead view captures the precise geometry of the Quadrangle and student housing at University of Pennsylvania. I’ve done many aerial shoots, so I’m able to accurately calculate time and cost. There’s nothing worse than underestimating the amount of time needed, or over-booking a pilot’s time. Experience matters. 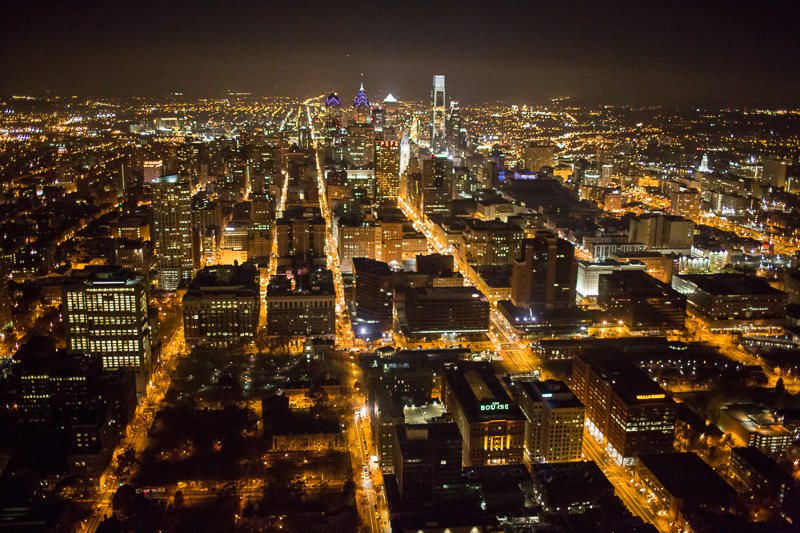 Philadelphia turns into glowing pockets of light when photographed from above at night. Before I climb aboard the helicopter, I like to have a clear vision of what I’ll see when I’m up there. I first look up the location on Google Maps and study the satellite view carefully. Once the client confirms that the building I’m seeing in the satellite view is in fact the one I’ve been hired to photograph (you’d be surprised how different something can look from hundreds of feet up in the air!) I mark down the GPS coordinates and print out the satellite view to help navigate the pilot. Windward Harbour is located at the northern tip of Avalon, New Jersey. 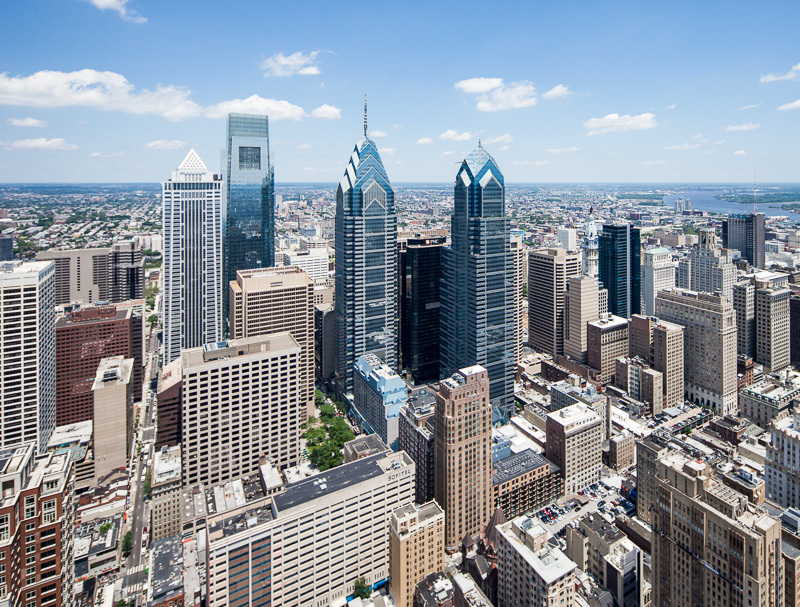 July and August are the hottest months in Philadelphia, and escaping the heat of the city — with all its concrete and glass — is on everyone’s mind. A favorite getaway is the New Jersey shore, where you can just leave it all behind. A few years ago, I visited the Shore (twist my arm!) 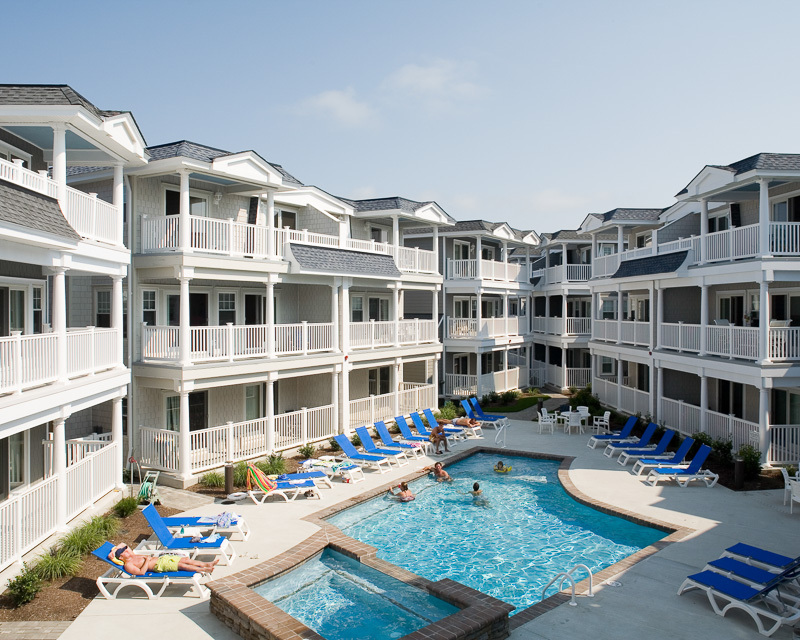 to photograph the charming Windward Harbour Condominiums in Avalon, NJ. E. Allen Reeves, Inc. was commissioned to rebuild Windward Harbor after it was lost to a fire. The Zacker Group Architects designed the 45 unit community which overlooks Cedar Island and the Atlantic Ocean. Docks are located right outside your door. 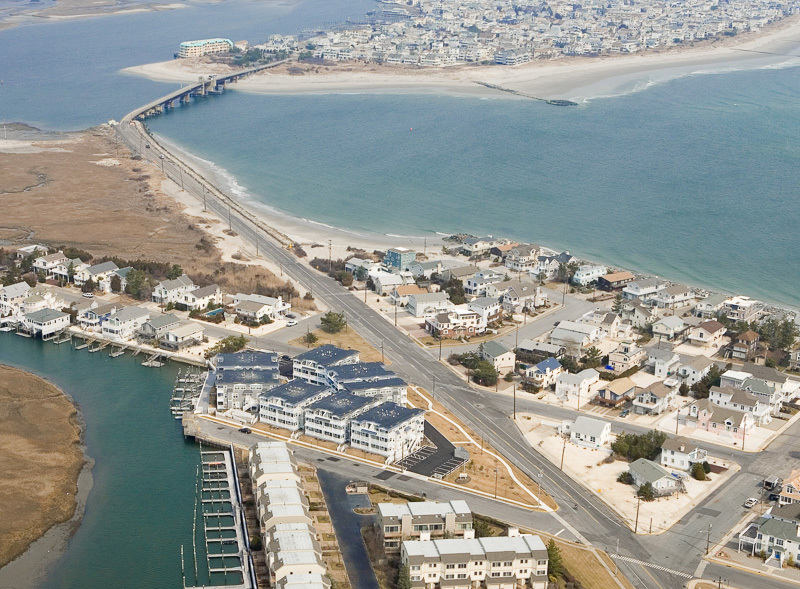 Windward Harbour is truly a piece of paradise on the Jersey Shore. If you ever get tired of laying out at the beach, you can enjoy the community pool or go boating. If you’re not in the mood for the beach, the pool or boating, you can relax on your shaded balcony. These views will never get old. Center City Philadelphia from the east. It’s a cold, dark night on the biggest shopping day of the year, and I’m hovering hundreds of feet above the city of Philadelphia. The world beneath my feet is glowing, the darkness pierced by pockets of light. Deptford, New Jersey, Walmart from 1000 feet. For three hours that night, we flew loops around Philadelphia in a small helicopter, capturing aerial photographs of cars at five different Walmarts to discover how large a parking lot should be. Walmart had commissioned an engineering firm to study the capacity of their parking lots on their busiest sales day. My aerial photos would help them answer the classic Goldilocks dilemma — are existing parking lots too big, too small, or just right? The answer is important: too large of a parking lot and money is being wasted, too small a parking lot and potential sales are lost due to customers not being able to park. Cockpit of Schweizer 300 helicopter as we approached our final landing. 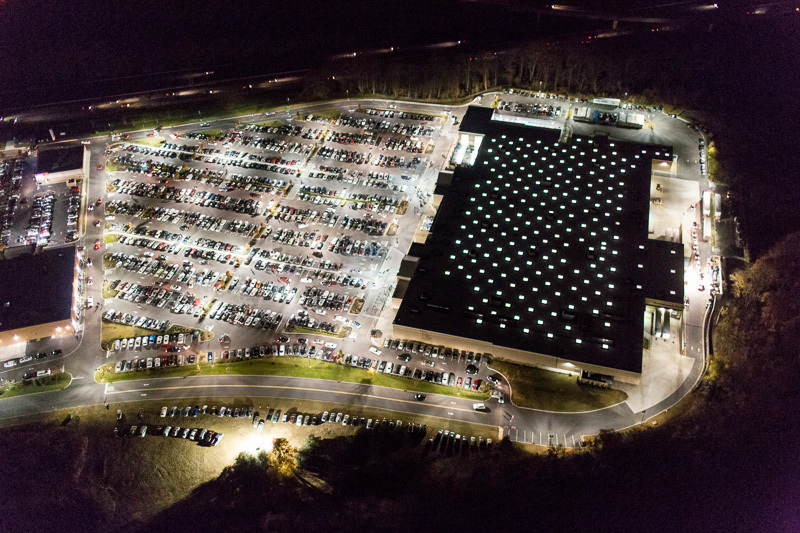 The next time you’re out shopping, remember that we’re out there too, working to make your life just a little easier through the magic of aerial photography. The world looks different from 750 feet. It is one thing to peer down past the wing of an airplane, viewing an entire city in miniature. It is quite another to hover just above the tallest skyscrapers in a two-man helicopter, close enough to see the texture of a stone, far enough to take in whole structures and spaces as never before. This gallery on my website showcases some of my aerial photography. Greg flying over the city. My commercial real estate clients love to have aerial photos of their buildings. For my part, I love flying in a helicopter with the door removed to get the clearest view and the most flexibility in shooting angle. To see and photograph buildings from the air is a visual treat. To me, flying in a helicopter is better than any amusement park ride. 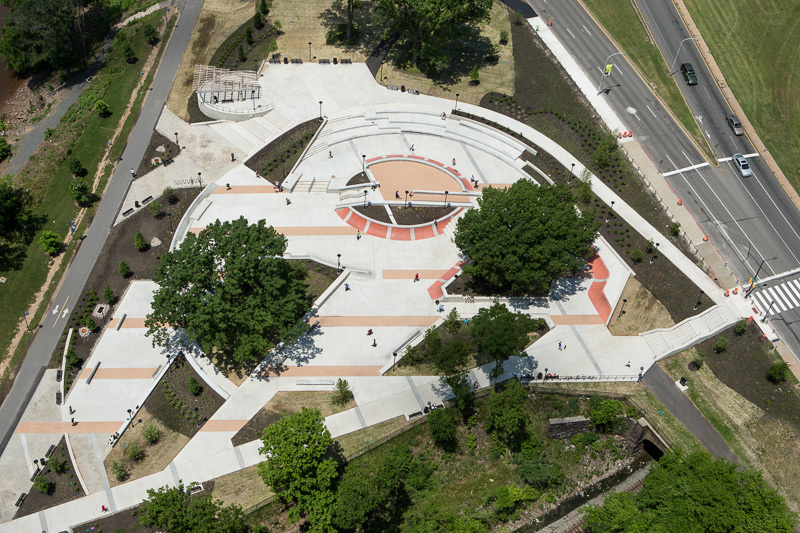 Paine Park, a skateboard park near the Philadelphia Museum of Art, opened May 2013. The high cost of renting a helicopter puts a premium on efficiency. With the engine often burning a gallon of gas every few minutes, it is even more important than usual to know where the sun will be, and which spots will afford you the best views of a building from on high. Planning for an aerial shoot involves studying the site on Google satellite view, finding a good weather day, and coordinating closely with the pilot. Pre-planning and good communication with your pilot make for successful photos and a safe flight. For more helicopter shots, see my previous blog post on using a helicopter to document an urban university's new park and athletic fields. I look forward to my next trip to the clouds. From up in the air, you begin to understand that architects and city planners are no different than we were as children, playing with Lincoln Logs, planning homes and offices for the people below. Recently the Penn Gazette ran a long feature on Penn Park, the University of Pennsylvania’s recently completed development of twenty-four acres for use as a public park and athletic fields. Greg was given the assignment to photograph for the article. The assignment gave him an opportunity to capture a place and the people using it. To illustrate the many uses of Penn Park and show it from many angles, Greg visited the park on four separate days. He also photographed it from a helicopter to show how the park sits in relationship to Penn's campus and Center City Philadelphia. Penn Park is a welcome addition of green space to this section of Philadelphia. Rainwater that falls on the artificial turf of the athletic fields flows into underground cisterns that will store 2 million gallons of storm water annually. This water will help irrigate trees and grass on the site. For Penn Gazette's coverage of Penn Park, photographs from the ground are not able to tell the entire story. Greg hired a helicopter to gain a higher angle in order to show the size of the site and how it sits in relation to the Penn campus and Center City Philadelphia. Getting good images from the air is an exercise in team work between the photographer and the pilot. To photograph from a helicopter it's best to fly with the door off. The cabin is very noisy and once in the air the only way to verbally communicate with the pilot is through a headset. The pilot also needs to stay attentive to any instructions he may receive from air traffic control, so chatty photographers need to keep their talking to a minimum for the sake of safety. Prior to hiring a helicopter, Greg shot the park from nearby high buildings, like Franklin Field. The view from there has power lines and the railroad line is prominent. The limitation of shooting this project from the ground led to using a helicopter. For all the complications, costs, and considerations, aerial photographs show angles that photography from the ground cannot. Satellite images, while showing a view from above, do not have the same spatial quality. For more on this assignment, see our post about photographing Penn Park from the ground.